English Major: Law 3+3 Option B.A. What is the English/law 3+3 option? If you’re interested in law school, our English/law 3+3 degree program offers the possibility of earning both a bachelor's degree and a law degree in six – rather than seven – years of study. After completing three years as an undergraduate and gaining admission to the UNH Law School through the approved process, you will become a full-time first-year law student. After your first year of law study, the credits you earn will count toward the J.D. degree and as credits sufficient to complete UNH's requirements for the bachelor's degree. 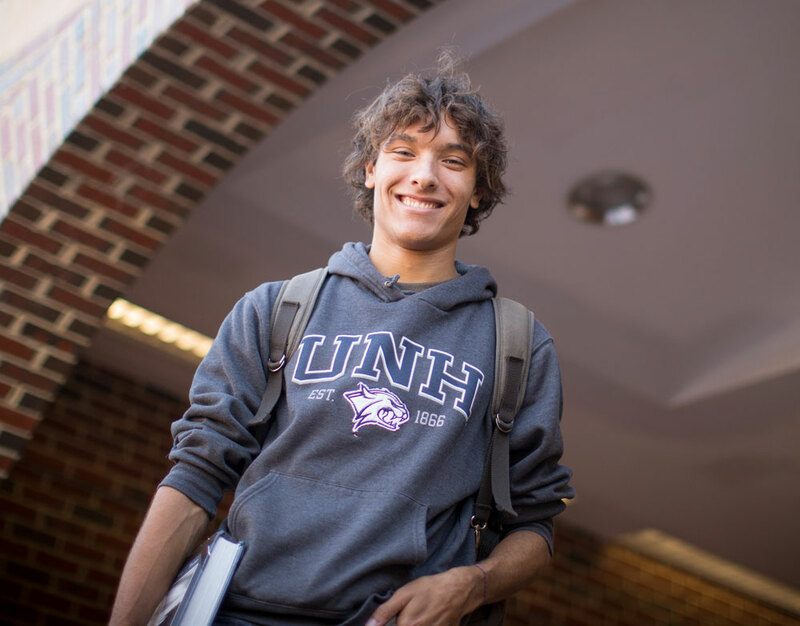 Why study English/law at UNH? 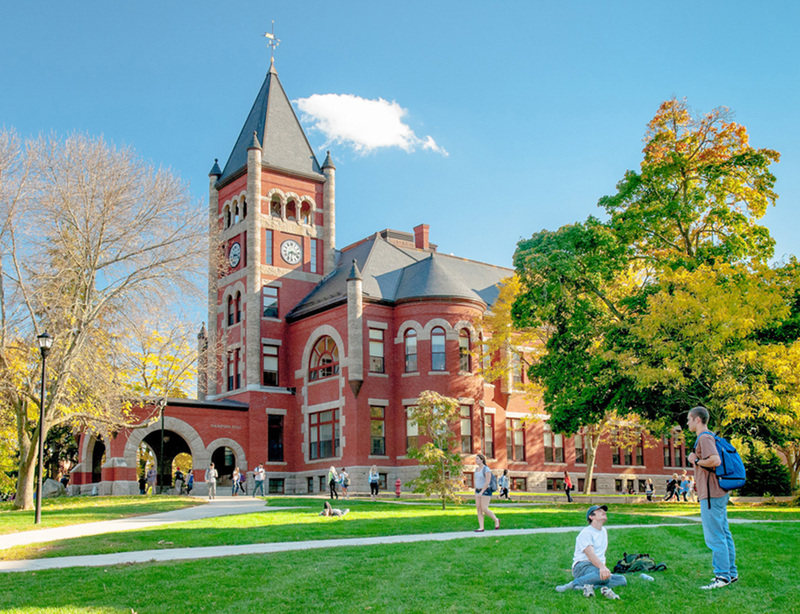 UNH boasts both an excellent English program and a highly-ranked law school. Experience the ease and convenience of completing both degrees at one institution, as well as the savings in both time and money that this accelerated track offers. English study is excellent preparation for law school and a successful law career. The 3+3 program offers highly motivated UNH undergraduate students of English the possibility to earn both a bachelor's degree and a law degree in six, rather than seven, years of study. After completing three years as an undergraduate and gaining admission to the UNH Law School through the approved process, the 3+3 program participant will become a full-time first-year law student. Upon successful completion of the first year of law study, the credits earned will be counted toward the JD degree and as elective credits sufficient to complete UNH's requirements for the bachelor's degree. Students apply to the program either when they submit their applications to UNH, selecting the English/JD option on the online application, OR after they are admitted to U NH, by applying directly to the English Department’s “English/Law 3+3 Committee.” In both cases, undergraduate applicants must fulfill the general requirements for admission to the English major. 3 or more years of CP or higher laboratory sciencs. A recommended score of 1200 or better (combined Math and Verbal) on the SAT or a 29 on the ACT. Have a 3.5 GPA in college courses at the time of application.The English Department Committee governing admission to the 3+3 program will also consider past SAT scores, maturity, and the abilitly to complete a highly demanding program of study based on performance thus far. For both groups, it is important to note that satisfying these requirements does not guarantee admission to this program. The review process is holistic (meaning all parts of the application carry weight and influence the final decision) and other components of the application will influence any admission decisions. Available space within the program will also influence who is admitted and how many students can be accepted. Complete all Discovery and major requirements, and accrue at least 98 credits before beginning law school in their Senior year. Maintain at least a 3.5 GPA (including transfer credits) at time of application to law school, and at the end of their Junior year. Take the LSAT no later than December of the final undergraduate yaer (i.e. the Junior year) and earn a score of 157 or above. Submit the law school application through the Law School Admissions Council by January of the calendar year in which the student wishes to enroll in law school. Below is a suggested course outline to help guide English undergraduate students participating in the English/Law 3+3 program through completion of their major and Discovery program requirements. Variations to this suggested path of courses may be undertaken with the approval of the student’s English undergraduate advisor. NEED: Beyond ENGL 401 First-Year Writing, 3 more WI courses, one in major, one at 600 level. LAW 475: Students should take LAW 475 Getting Ready to Succeed in Law School at some point during their Sophomore year but no later than the first semester of their Junior year. This course, taught by a UNH Law School faculty member, will teach students how to prepare for a legal education. The course will instruct students on the LSAT exam and offer valuable strategies on how to improve LSAT scores. Such instruction will include administration of practice test questions as well as explanations for answers. This two-credit course will also explain the necessary study skills to excel in law school. HONORS: It is not necessary to complete the honors program, but it is possible: Honors in Discovery + Honors in Major with Thesis (See addendum I) . SEQUENCE: With the exception of ENGL 419 Introduction to Literary Analysis and ENGL 787 English Major Seminar, English courses don’t need to be taken in any specific order; the guide above is only a suggestion. In general, 500-level courses should be taken before 600-700 level ones. However, a student could take a class that satisfies the Race Requirement in Semester I of Junior year rather than Semester II, or a pre-1800 600-700 level literature course in Semester II of Junior year. As long as all the categories listed above are met, students have the flexibility to choose the courses that best meet their interests and schedules. There are some writing and journalism courses that have prerequisites, and students should be careful to note these before choosing upper-level courses in those fields. ADVISING: It is very important that students progressing through the 3+3 English/Law program maintain close contact with their degree advisor. This will help students remain “on track” to complete degree requirements, and the advisor will guide the student into the next phase of the program, admission to the Law school. Students who plan early and work closely with their advisor may find it possible to include study abroad and participation in other University programs, if desired, but only with careful planning. All students participating in the English/Law 3+3 program are strongly encouraged to consult with the pre-law advisor on campus: Paula DiNardo, paula.dinardo@unh.edu; 603-862-2064. This is a possible Law School course outline. Variations to this suggested path of courses may be undertaken with the approval of the student’s Law school advisor. The schedule and track of the second and third years of law school are directed by each student with careful advising from the law faculty. Students in the English/Law 3+3 Option complete the requirements of the English major. See the Degree Plan for the recommended path through the English major. Take the LSAT no later than December of the final undergraduate year and have a score of 157 or above. Submit the law school application through the Law School Admissions by January 1 of the year in which the student wishes to enroll in law school. As an English major, you must complete a minimum of 40 credits of major coursework with a grade of C- or better, the one exception is ENGL 419 Introduction to Literary Analysis, which must be completed with a grade of C or better. You cannot use ENGL 401 First-Year Writing, ENGL 403 Exploring Literature, ENGL 415s, "Literature and..." courses, and ENGL 444s to satisfy major requirements. Note that any one course may satisfy more than one requirement. This must be completed with a minimum grade of “C.” ENGL 419 Introduction to Literary Analysis is the only 400-level class that may count towards the English major. ENGL 403 Exploring Literature, ENGL 415s, "Literature and..." courses and ENGL 444s will NOT count towards this major. ENGL 501 Introduction to Creative Nonfiction may be included here. You may include any advanced-level courses even if taken to fulfill literature requirements above. Minimum grade required: C. The course you select for your Capstone may not be double-counted toward English major requirements. At the time of registration , you must submit a Capstone Declaration form indicating the English course you're taking for capstone credit at the time of registration. You can pick up a capstone Declaration form in the English Department main office. Either two advanced courses, or one advanced course and one of the following: ENGL 514 British Literature III: Revolts, Renewals, Migrations, ENGL 515 American Literature I Conquest and Nation: First Contact to the Civil War, or ENGL 516 American Literature II Money, Migration, and Modernity: Huck Finn to Beloved. English majors may use one major-required course to satisfy one Discovery category requirement. English majors may only count one online course toward their English major requirements. If you're interested in majoring in English please contact Carla Cannizzaro, coordinator of the Department of English, 230F Hamilton Smith Hall, (603) 862-1313. The following summarizes the required curriculum and bar recommended curriculum. 85 credits are required for graduation. Questions about the English/Law 3+3 program should be directed to UNH’s 3+3 advisor.